While the marketing strategies you deploy may vary if you’re a $5 million company vs. a $250 million company, the trend toward outsourcing or supplementing your marketing teams with external resources is clearly on the rise. In fact, according to a 2018 CMO Survey, B2B Products and B2B Services companies predict spending 3.3% – 3.6% more on marketing consulting services in 2018 over 2017. Marketing outsourcing and/or augmentation makes good business sense. Keep reading to learn the reasons why. 1) You need a full set of marketing skills and expertise, but you don’t have the budget or desire to maintain all these skillsets in-house. The need for diverse skill sets and expertise is the most common reason business leaders turn to marketing agencies for assistance. The skillsets needed to develop, deploy, run and measure best-of-breed marketing programs are extremely diverse. Skills range from building marketing plans and lead generation strategies to website design and development, social media marketing, graphic design and copywriting. Finding, hiring and staffing for all of these skill sets is extremely expensive and increasingly difficult to find. With marketing outsourcing, you can keep all of the marketing expertise you need at the ready without carrying the direct costs of recruiting, hiring, training, payroll and benefits, and the entire team. 2) You’re ready for sophisticated marketing automation, technologies and capabilities but don’t have the internal resources or know-how to manage these platforms. There are literally hundreds of marketing technologies that are helpful in building and running effective marketing programs. But where do you start? And once you hone in on the technologies you want to invest in, does someone on your team have the expertise and bandwidth to make sure you are leveraging all the capabilities? The right marketing outsourcing partner can help you build growth marketing initiatives with marketing automation tools that integrate lead scoring, web analytics and social media without breaking the bank. 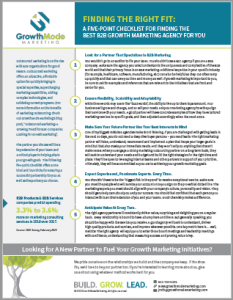 GrowthMode Marketing offers agency licenses for Act-On and deploys and manages the tools on a client’s behalf. Clients can also purchase Act-On directly and have GrowthMode assist with implementation and ongoing support as needed. We can also work within other marketing automation platforms clients may already be committed to. Regardless of what works for you, the right agency can help you investigate, acquire and optimize sophisticated technologies you may not otherwise have the capacity to support. 3) You want the ability to ramp marketing activities (and skill sets) up and down as needed. Naturally, as your business priorities change, so do your marketing needs. A big advantage of outsourced marketing is the ability to stay nimble. You can ramp up activities and align skill sets in certain areas when you need them. For example, you may need heavy hitting messaging, brand-building support or product launch strategy as you develop your foundation. Then your focus may shift to seasonal campaign work and tradeshows mid-year. Or, you’ll launch a new website and require continuous improvements and SEO optimization. Your ongoing lead generation and pipeline-filling activities may need to be dialed up based on changing competition, industry trends or internal priorities. A good B2B marketing outsourcing agency will flex to meet your needs and optimize your results. 4) You’re looking to save costs and improve effectiveness with your current marketing spend. Marketing outsourcing may cause some initial sticker shock as you begin your search. However, when you peel the information back, you’ll likely see that marketing outsourcing and augmentation is actually a very cost effective choice. 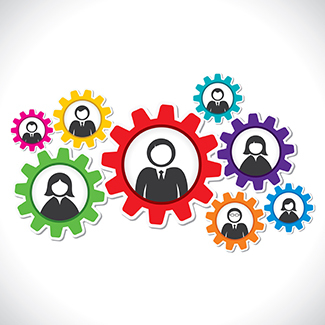 Industry statistics vary as to how much a company saves when outsourcing marketing activities. Generally speaking, you can expect to spend about $10,000 – $15,000 per month for a six-month to one-year outsourced marketing retainer program. This is equal to the cost of one marketing director or vice president with 10 – 15 years of experience at an annual salary of $120,000 – $180,000. You can see pretty quickly why marketing leaders are increasingly choosing outsourcing as a viable solution to support growth initiatives. For the same price or less, they acquire all the skills they need, plus flexibility to tap into additional areas of expertise as their growth marketing needs and business priorities evolve. 5) You would like validation from an expert that you are getting the most out of your current marketing programs. One significant advantage agencies have over corporations is that they get to work with several marketers across multiple industries, in different stages of growth and change. Working with a trusted agency partner allows you to tap into all of the experiences they bring to bear across their entire client base. They have seen what works and what doesn’t and they can apply those learnings to your programs to maximize results. If any of these drivers apply to your organization, you should seriously explore marketing outsourcing or augmentation. To ensure you find the right fit with a B2B marketing partner, download our Marketing Partner Fit Guide. Interested in Marketing Outsourcing or Augmentation? Contact GrowthMode Marketing for a conversation. We’ve helped countless organizations reach their growth initiatives. We’d love to help you, too.